With the commotion from our fast-paced world, it's difficult enough to hear our own thoughts, let alone try to listen for the voice of God. But in order to fulfill the great plans He has for us, we need to be able to recognize His voice. Learning to hear from God and be led by the Holy Spirit is very exciting. God wants to speak to us about the plan He has for our lives. His plan is a good plan, but we are in danger of missing it if we don’t learn how to listen to and obey God’s voice. We talk to our children all the time—why wouldn't our heavenly Father talk to His children? We would not expect our children to know what we wanted them to do if we did not talk to them, so why would God feel any different? God wants to speak to us about the good plan He has for our lives. He sent His Holy Spirit to dwell in us and be our Counselor and Helper in life as well as other things. John 14:26 says that He will teach us all things and will bring to our remembrance things God has taught us. The Holy Spirit is the Spirit of Truth; therefore, He will lead us into truth, not error. God reaches out to us every day, offering guidance for everything from major life issues to small, ordinary problems. The question is, Are you listening? 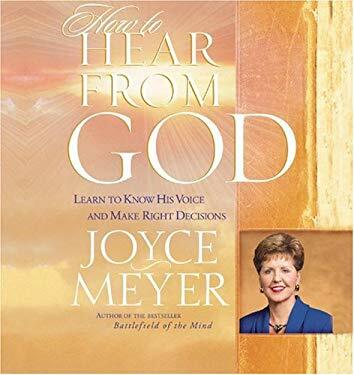 JOYCE MEYER is one of the world’s leading practical Bible teachers. A #1 New York Times bestselling author, she has written more than seventy inspirational books, including The Confident Woman, I Dare You, the entire Battlefield of the Mind family of books, her first venture into fiction with The Penny, and many others. She has also released thousands of audio teachings as well as a complete video library. Joyce’s Enjoying Everyday Life radio and television programs are broadcast around the world, and she travels extensively conducting conferences. Joyce and her husband, Dave, are the parents of four grown children and make their home in St. Louis, Missouri.